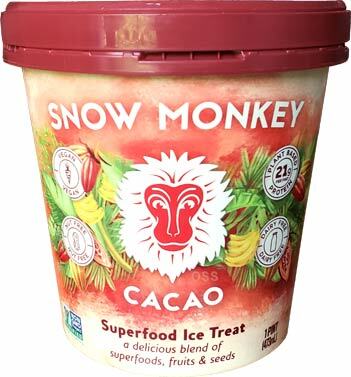 So Nestle (Edy's/Dreyer's) isn't the only company with a banana based frozen treat on the market right now. 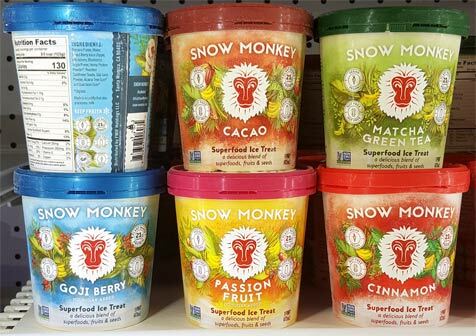 At both Wegman's (regular $6.49) and Market Basket (regular $4.89), I found Snow Monkey which has Banana Puree as it's primary ingredient. The flavor line up is Cacao, Matcha Green Tea, Cinnamon, Passion Fruit, and Goji Berry (with the last two having no added sugar). The big selling points are vegan, paleo, nut free, dairy free, and 21 grams of protein per pint. "a delicious blend of superfoods, fruits & seeds"
Now I was tempted to buy these for my son, but I didn't jump on them until they were on sale for either $3.50 or $3.99 I believe. I'm not crazy enough to try all 5 at once (especially on something like the one that mixes green tea and banana), but the chocolate one seems like the most likely to win over my son. There is no cream or anything so this one is rock coming out of the freezer. I'm sparing you the opening freezer burned shot as this has been in my fridge for a good month, maybe two. We wait about 7-8 minutes and my son is getting pretty hungry, so he decides to eat it as is. He says it smells like his beloved Polish Ice and takes his first (tiny) bite. He says it's delicious.... a statement he takes back about 90 seconds later as his tiny scoops eventually make him realize that this tastes way more like banana than chocolate. I take a very small bite and I get what he's saying. Also, it's way more like italian ice or sorbet than ice cream. I scoop some in to a bowl, let it melt for about ten minutes, mix it up, and then try to get my daughter to eat it. Nope, not a fan either. The problem is that none of us are banana fans, so it's got a lot to overcome to win any of us over. I am a little curious if I could make a half decent shake with this stuff, but that's an experiment for another day. "Dubba, why even bother reviewing this stuff?". Well, for a few reasons. One, I really was hoping my son would like this stuff even if it was a long shot. Two, I want you to know it's out there. Three, I want to open the floor for discussion on this product. Have you had it? Would you try it? Which one would you grab first? Does $6.49 seem like a lot to risk on a fringe product? I wouldn't get it just because of the low calcium--I know that seems silly, but I eat ice cream just to help get in the 250% RDA that my doctor recommends for me. I wouldn't buy it because of the price and the fact it's not ice cream. While I love banana products, won't even buy frozen yogurt or sorbet anymore. I would try it, though I'd have to love it to pay $6.50 a pint more than once (I'm cheap and probably would wait until it's on sale to even try it). 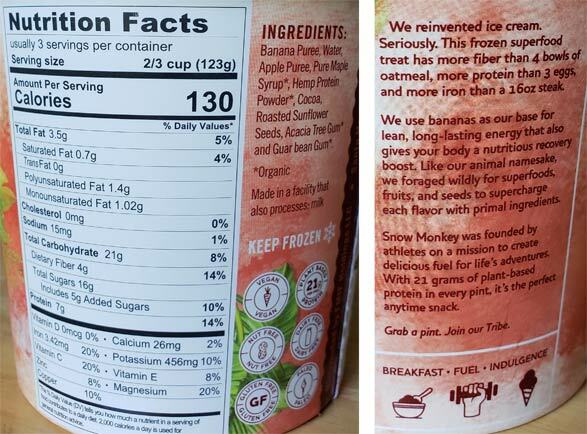 I admittedly do not pay attention to the added sugar labels on the ice cream products I buy, but assume those are almost all added sugar, as compared to 5/16 in your Cacao. I do like bananas, so I probably would try the Passion Fruit flavor (why isn't there just a straight banana flavor? 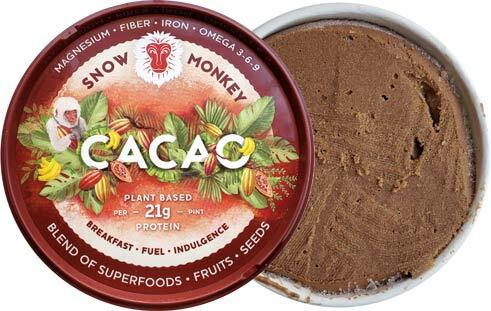 ), as the cacao or green tea flavors sound a little goofy, at least with a banana base. My guess is that I would rather eat a banana and ice cream separately (banana splits aside) rather than a frozen dessert of banana puree. While it's great that it's (like other various alternatives are) healthier, it just feels pricey; maybe it's just because they can get people to pay it, but I'm surprised things like Arctic Chill and other "healthy" alternative pints aren't cheaper by now. Also, am I just missing the Nestle/Dreyers/Edys version of banana puree in your reviews? The linked URL to posts tagged banana starts with Haagen Dazs and then a few limited edition non-Nestle items. I think I'm in the minority when I say I would totally try it. Although my family loves the chocolate coated bananas on a stick that they sell at Trader Joe's and in theme parks. I also think I'm in the minority when I say that it's definitely worth reviewing. I am definitely an ice cream fan through and through. It's in my heart and soul. However, I realize there are times when it's not healthy to scarf down copious amounts of ice cream. There are also times when I just need something a little lighter or more healthy. I like to have other options. For me personally, my two favorite non-ice cream items that are like ice cream are: (1) rita's mango or mango/pineapple flavor and Dole whip pineapple or strawberry/pineapple swirl. Those two items can sway me away from ice cream every time. I'm a huge fan of the banana based Outshine line, so I'd probably try most of these, but only at a price that's competitive. Not available around here right now, though. I've tried the goji berry and cacao. My favorite is the cacao, it was actually really enjoyable when you're craving chocolate but want something a bit more natural tasting. It's like chocolate banana, of course, but I've already gotten it again! That being said, not nearly as good as regular ice cream. I wrote to the company when I saw it in Wegmans several months ago, before these other flavors came out, and the company was awesome. They mailed me two free pint coupons and some additional coupons for an x amount off (can't remember how much it was, it might've been $1 or $1.50). Super sweet of them! Far to easy to make my own banana "ice cream." It's only a little more complicated than throwing frozen bananas into a food processor with whatever flavoring and mix-ins I want. As the US's favorite fruit is also cheap... well, I'd have to be bananas to pay what they are asking. HA! Well played Joe. (I actually have a "yonanas" machine for making banana ice cream, it's crazy loud).